Wskazowki dla tworcow textur; uzyskane na BiForums od Panow 's8n' i 'skaven' (dziekuje) dotyczace aplikacji Normal Maps na nasze cudne addony. Pierwsza metoda to sposob 's8n'a. Efekty jej uzycia mozna podziwiac w jego jednostkach CSLA. 2. I always reedit the BIS textures, from what i have read on biki game will notice the type of texture due the _nohq _smdi prefix, so i dont change it. 3. to create normal map convert your soldiers texture to grayscale (i know this is not the elegant and right way to do it but hey nobody pays me for this and i wont spend 1000 hours on painting whole new grayscale texture from) - run Nvidia filter (play with settings to achieve good bumps similiar to BIS ones) copy that normal map to the default BIS normal (_nohq) texture you can erase the unchanged parts and then merge it to one layer. 4. switch to chanels tab in photoshop - click on rgb chanel copy whole texture, switch to alpha chanel and paste it over it here you can add some height to texture using burn/dodge tools. btw. here is a nice link about normals etc. I do my normal maps in photoshop but you may do it inside your 3d software, however I'm not a modeler so I will use only the Photoshop tutorial here and to be honest so far and in my opinion the quality seems to be exactely the same. and last the file that gives the amount of colour to the normal map (don't recall the real name of this one but it's not relevant here). What I worte above covers everything you need to start on the cpp file and it's pretty easy to do, just be careful while wrighting the config a small mistake on a coma will be enough to won't make it work and you'll take a long time to understand where you made a mistake. The first thing you will need to do is to download the Nvidia PlugIn and install it inside photoshop than open all the texture files you want to normal map inside photoshop. 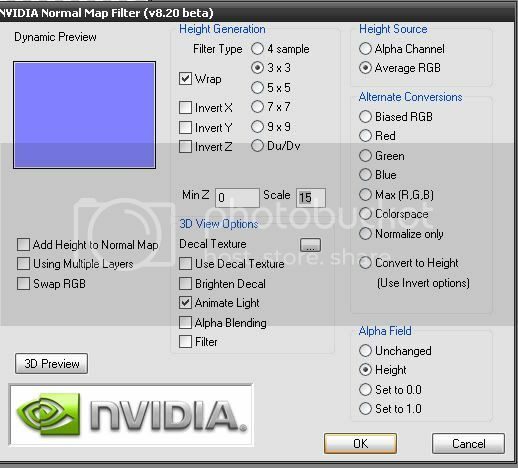 Once in Photoshop you have the filters above, inside of it you will have a new one called Nvidia... press it and you will see a new window, inside of which all I do is to change the percentage of normal mapping. Perssonaly I use values between 3 and 10 but you will have to try this one for each weapon (maybe texture) since it does have a lot to do with the type of colours the textures have as well as to how detailed the models are. It's really try and error here but I would use a value like 5 for my first try. Press enter or apply and you will see your old texture with the normal mapped filter applied now you save it as *****._nohq.paa (just like you did inside the config.cpp file) and you place where you described. Perssonaly I use a new folder for my normal mapps but this is actually a matter of organization you may not feel the need for it. Once you applied and saved the normal mapped textures (Nvidia Plugin) you want to make the pink textures (the ones I don't recall the name in English). So to achieve that you will take one of mine and you will copy the pink colour from one of my them since that's exactely the pink you will need. Once you did this, now you will again, open the textures as you did at first (or you may just go to history and go a step backwards so you have your textures like they where initially withouht the Nvidia PlugIn). With this done you will now open a new layer for each texture and paint the layer with the pink you got from my addon (paint the entire layer) once you did this for all the textures you will now give it instead of the usual 100% opacity/transperency you will give it something between 85% and 95%, too much will give less power/colour to the normal map too less will make it shine too much and make it ugly, again you will have to try and error but I say go for 95% on your first try. Once you did this for all the textures you have to save them*****_smdi.paa (again put this files where you declared on your config). Now open the model INSIDE O2 (not gatebuilder) and normalize (F5) all the lods. PS1: At the beggining this may seem complex but in reality it's extremely easy the problem is that a small mistake in the config file or while naming the normal mapped textures won't allow it to work and it will be very hard to spot the problem. PS2: The values declared inside the config like the power are values that indicate the power/type/light and ammount of normal maps, perssonaly I didn't use them much but I may give you further assistance on this if you need me to. 1. Są 2 sposoby ich robienia, pierwszy łatwy polegajaąćcy na wygenerowaniu z istniejącej tekstury i drugi bardziej skomplikowany ale dający dużo lepsze wyniki polegający na stworzeniu modelu o bardzo dużej ilości poli i uzyskaniu z niego tekstury nohq. 3. Jeżeli dysponujemy wyłącznie teksturą bazową to w tym przypadku przypadku pomocny jest filtr blur -> surface blur (CS3) który powinien rozmyć piksele. 5. Błędem moim zdaniem jest to co zrobili ludzie z BIS z bronią, tj uważam że tekstura nohq powinna głównie uzupełniać teksturę główną a nie dodawać wypukłości itp sama. 2. Podstawowym błędem w tworzeniu jest małorealistyczne oddanie połysku powierzchni. Należy najpierw obejrzeć dany obiekt który przenosimy do gry w naturalnym środowisku i patrzeć co na nim odbija światło bardziej a co mniej. Ja stosuje przedział skali od 7-15. Po tym mamy już gotową nohq która możemy obrabiać poprzez zamalowywanie kolorem tła (jasnoniebieski pobrany pipetą z płaskiego miejsca) miejsc które chcemy by były płaskie a wyszły inne. Podczas konwersji do paa dodajemy do nazwy "_nohq" np sh_nohq.paa . Otwieramy teksturę z której mamy robić smdi, wypełniamy kolorem białym kanały czerwony i niebieski, przyciemniamy bądź rozjaśniamy elementy uwzględniając oryginalne własności powierzchni w kanale zielonym. Następnie otwieramy teksturę w formacie tga programem Texview2, dajemy edit -> filter -> load -> katalog texview2 -> filters -> specularMapFinish.bitfilt . Gdy zaaplikujemy filtr teksturę należy zapisać z dodaniem końcówki _smdi np sh_smdi.paa. Rvmat tworzymy programem MatEditor z katalogu o2. Z ustawieniami trzeba pokombinować by uzyskać dobry efekt. Więcej na temat tego formatu jest na bis wiki. Gotowy rvmat dodajemy do modelu w okienku material po naciśnięciu "E" w o2.